Well, hello friends! Happy Monday! Sharing another fall outfit - well, because I'm over this heat in Dallas! I'm convinced that this year it's going to be in the 90s until November. Ugh, I hope not! I'm ready to wear booties and scarves and sweaters... have I said that before? Is fall anyone else's favorite season? I can't get enough. Also, Starbucks has officially released the PSL (pumpkin spice latte). <Insert basic white girls here>. No shame in my game, I'll be sipping one in the near future. Anyway, so more about this look. Easy, right? 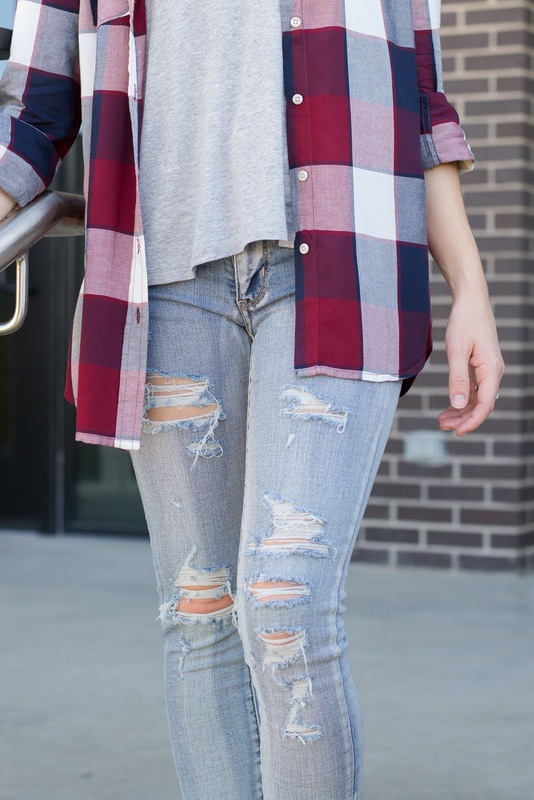 A basic tee and a plaid. Bam, done! Have I mentioned that Target is killing it in the clothing department right now?! Every time I go in there I leave with a few pieces. At least they're affordable! 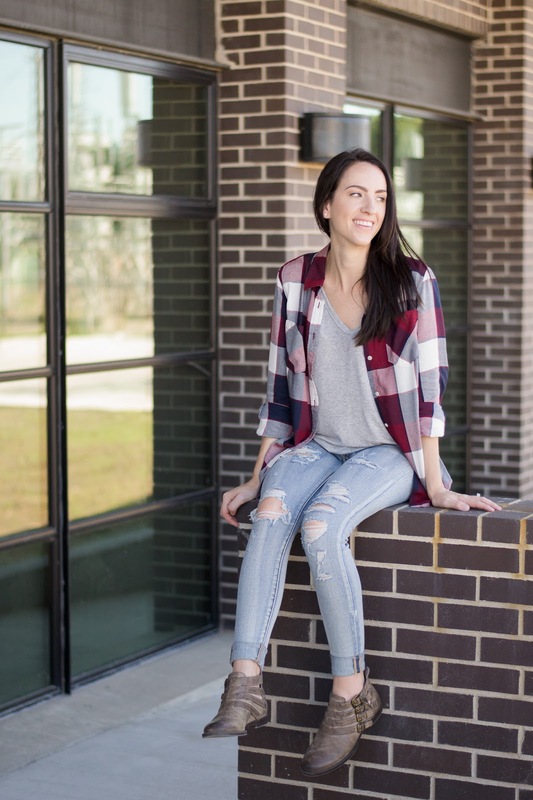 This plaid is from Target and under $25, and of course paired with my new favorite basic tee - from Nordstrom. I am a lover of distressed denim, that's no surprise. You can usually find me in a pair of rips on the weekends when the weather cools down. If they were appropriate for work I'd be wearing them there, too. Side note - what denim are you obsessed with? I usually get mine from American Eagle but would love to try out a new brand. Jeans are hard, and I'm kinda picky. But give me all your recommendations in the comments below and I'll be sure to check them out. Some of my picks for fall boots and a recap on our Vegas trip coming to the blog soon. Stay tuned! I am so over the heat too! We had a slight cool down and now it's back in the 90's. But I'm with you, let's just wear our fall clothes until mother nature gets the hint! Sounds great to me! Plus, seeing fall clothes everywhere... ugh!! I got a pair of Articles of Society denim from Nordstrom last winter and I like them! Price tag is great - generally around $50 - and they are thinner than my Banana Republic and Gap jeans, so easier to wear with warmer temps now that I moved to SoCal! They would for sure work in the fall Texas heat! Great! Thanks for the recommendation. I'll have to try a pair out!